Vinton Unlimited is excited to announce the addition of Shelby McDonald to the office for the summer. Shelby will organize the Annual Vinton Unlimited Golf Tournament, assist with Boom-Fest preparations, attend City Council meetings, help plan for the Sesquicentennial in 2019 and many other things. Shelby will be a senior at Vinton Shellsburg in the fall. Shelby is active in 4-H, FFA, Vinton Shellsburg athletics and Cooling Dance Center. Melissa Schwan, Vinton Unlimited Director, is excited about Shelby’s experience and involvement in Vinton. “Shelby is already familiar with Vinton, so the initial groundwork is already laid. 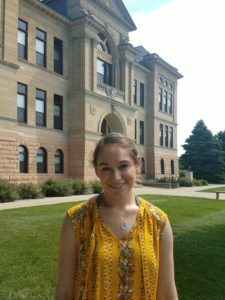 With her leadership and experience gained through 4-H and FFA, I think she’ll be able to contribute to the organization in some very strong ways.” Schwan is also looking forward to a young, new perspective on various events. “I’m excited to get out in the community and help with these events, it should be a fun summer filled with a lot of new experiences,” noted Shelby. Shelby will work out of the Vinton Unlimited office located in City Hall. You may reach her at vintoninfo@gmail.com or 472-3955. Please join us in welcoming Shelby!